A police force has defended scanning the faces of 90,000 festival-goers this weekend and checking them against a list of wanted criminals across Europe. Leicestershire Police, which used facial recognition technology on revellers at Download, said it had now destroyed the information it gathered. It was believed to be the first time the software had been used at an outdoor event in the UK. The trial was criticised by campaign group Big Brother Watch as "worrying". Images of people were compared against a database of criminals who target music festivals across Europe, the force said. Ch Supt Chris Haward said no one who came to the festival to enjoy themselves had anything to worry about. "The software provided an efficient and effective way of picking known offenders out of a crowd - something that officers would previously have been done using paper briefings," he said. "While it is too early to give definitive crime figures, early indications are that it has remained low." Officers would "use their discretion appropriately" in the unlikely event of someone being wrongly identified, police said. But Renate Samson from Big Brother Watch said the way police went about the scheme was "a great worry". "We're very keen for bad people to be caught but we're also keen for innocent people to go about their day-to-day business, have a good time at festivals they've paid good money for, and not feel as though they're being surveyed by police," she said. A cashless payment system was put in place for the first time in a bid to cut crime. 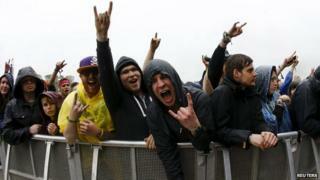 Thousands of revellers braved the rain at Download, held at Donington Park, to see headliners Slipknot, Muse and Kiss.